There aren’t many social platforms with “one billion monthly users” in the world, so when the opportunity arises for social media marketers to create and target ads on such platforms, they practically drool. That’s exactly what’s happening as Facebook begins “very small” testing in Thailand and Australia to implement targeted ads inside Messenger itself. Eddie Zhang, Facebook product manager, said in a statement about the new ads that, “Businesses have long been telling us that they are very excited about the potential of the Messenger platform to reach their customers and help them to drive sales, build brand awareness and increase customer satisfaction.” And it’s no wonder since Facebook says people send over 1 billion messages to brands every month through Messenger. Facebook released the plans in early 2016 for these new ads, and now it appears to be coming to fruition. Due to reduced ad loads in users’ news feeds, Facebook has announced its advertising revenue growth would “come down meaningfully” next year. In a blog post, Facebook reassured, “No one will see an ad in a conversation without clicking on an ad experience on the Messenger home screen or starting a conversation with a brand.” So fortunately, ads will not be randomly popping up in your Messenger app conversations. Phew! But, targeted ads will still appear in the Messenger app itself to be clicked on. When a person clicks on an ad in the news feed, it will directly open a Messenger thread from a bot with the copy and structure configured by the social marketer. This is big news in terms of Facebook's advancement, since 85% of customer interactions are predicted to be with a bot by 2020. And, like all existing Facebook ads, businesses will be able to select their target audiences and delivery times. It doesn’t stop there, folks. 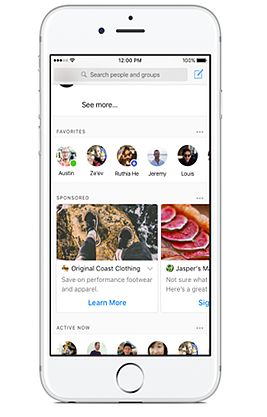 Along with Messenger ads, Facebook is also rolling out enhanced mobile sites within Messenger. This will allow people to effortlessly interact with a business’s mobile-friendly site within the app. Why not add easier payments, too? Facebook is also creating a new way for businesses to sell their products or services within Messenger. The idea is to go from conversation-starter to purchase, all in one place. Allowing payments within the messages, plus bank-level encryption, will make shopping easier and just as safe. Unlike before, when users start a new thread with your company’s bot in the Messenger app, they will be greeted with a welcome screen that provides more information about your business, such as your reply time, category, logo, and more. While some of these features are still in testing, features like the welcome screen and enhanced payments are already available. And with so many monthly users (and a reduction in news feed ad volume), it may be time to invest more in Facebook Messenger.